Common house flies are a nuisance. 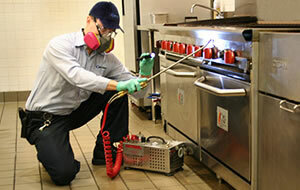 But to a restaurant, hotel, or health care facility, flies also present a serious food safety concern. Flies carry dangerous pathogens that can cause serious human disease such as Salmonella and E. coli. Flies have a keen sense of smell that attract them to food, and can easily transfer their pathogens from their bodies to food and food handling surfaces. Our decorative, inconspicuous Fly Elimination Lights are designed for use in full service restaurants, hotels and health care facilities. Our lights utilize a patented trapping system: flies and other flying insects are fully contained inside the units. Once trapped, they are there to stay. MATRIX utilizes programmable Timed Misters, mounted on your wall in strategic locations, which safely release a fine mist at specified intervals of your choice to offer constant protection against flies. Finally, MATRIX utilizes specially designed residual repellents and baits throughout your home or facility to provide long lasting Fly Elimination and defense. Matrix Pest Elimination can also solve your Fruit Fly problems too!